The GWSP-SSC meeting will start after the closure of the GCI Conference “The Global Dimensions of Change in River Basins” in the venue of the conference. The conference is expected to end at approximately 14h. The start of the SSC meeting is 15 30h. It is foreseen to have on this afternoon a part of the meeting (approximately one hour-long) a closed session involving members of the SSC and staff of GWSP IPO only. Reception SSC members, all invited participants of the SSC meeting from 9th December onwards, donor and other ministry representatives, leading academics and research institutes in Bonn, staff of IHDP Secretariat and GWSP IPO are invited to attend the kick off reception. 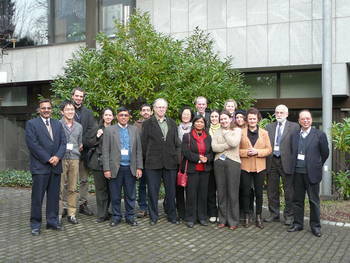 The sessions on this day are attended by invited guests and representatives of the GEC programmes and ESSP. Agenda II-4. Reports of regional initiatives and activities and the development of regional nodes of GWSP (China/Asia, Africa) Roland Schulze, Jun Xia. Presentations: Ninad Bondre (PDF, 2MB) and Olga Zolina (PDF, 958KB) and Anne-Hélène Prieur-Richard (PDF, 2MB). The 3rd day is continued with the participation of SSC members including ex-officio members, representatives of ESSP and the GEC programmes. Agenda III-1. Presentations by SSC members IGWCO Community of Practice activities and GEO, Drought studies, GWSP –GEWEX links through RHPs etc Rick Lawford, Joyeeta Gupta, Felino Lansigan, Sharad Jain. Teleconnections between global catchments through virtual water trade Hong Yang. Agenda III-2. Discussion of the presentations of Session 2 and Session 3. Distill consequences for GWSP and its future activities and priorities for 2011.